Psoritatic arthritis is a type of inflammatory arthritis that will develop in up to 30% of people who have the chronic skin condition, psoriasis. Gout, also known as podagra (when it involves the big toe joint), is a medical condition usually characterized by recurrent attacks of acute inflammatory arthritis-a red, tender, hot swollen joint. 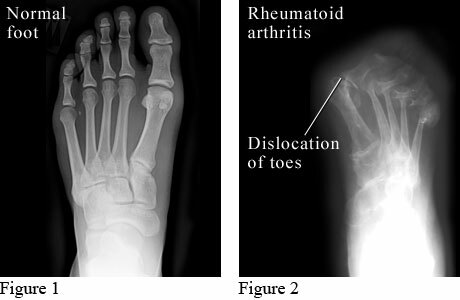 The metatarsal phalangeal joint at the base of the big toe is the most commonly affected (approximately 50% of cases). It is caused by elevated levels of uric acid in the blood. The uric acid crystallizes, and the crystals deposit in joints, tendons, and surrounding tissues.